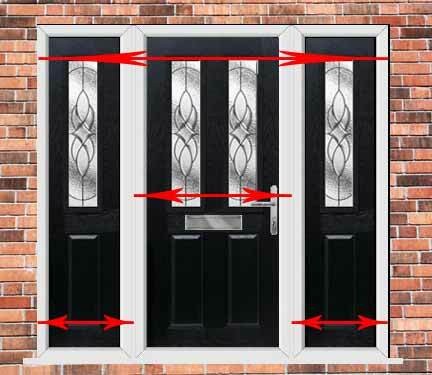 These guidelines are to help you measure for a new double glazed door and/or window and make an accurate measurement. Measure the opening outside on both the height and width. 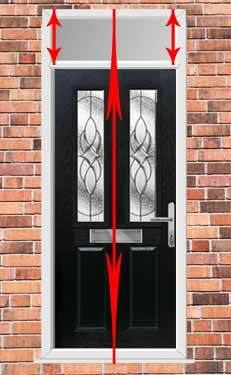 Always measure the exact brickwork opening and not the old frame or door. Measure brick to brick in at least three different places and deduct 10mm from both the final height and width measurements to allow for 5mm fitting allowance around the new frame. This will enable you to ensure the new frame sits plumb and square once in the aperture. Spacers and filler will then be required to secure the frame into place and fill any gaps. Measure in at least three different places and we recommend deducting 10mm from both the final height and width measurements - we do not make any fitting allowances on the sizes you provide. 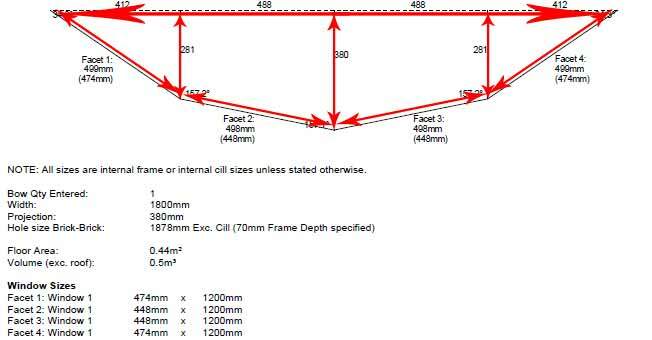 Measurements will need to include the frame, cill and any frame extenders/add on’s required. Measure in at least three different places and deduct 10mm from both the final height and width measurements - we do not make any fitting allowances on the sizes you provide. 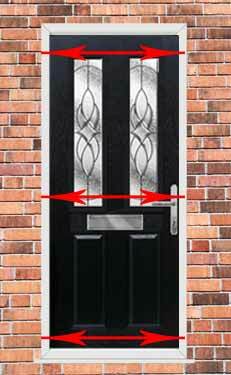 The side panel width should be measured from the centre point of the frame between the door and the side panel, to the outer edge of the side panel frame. The top light depth should be measured from the centre point of the frame between the door and the top light to the top of the door frame. This will give you the transom drop for the top light. Square Bay windows consist of three sides and two 90 degree corner posts. The width (back span) will need to be measured internally from the existing frame edge to edge. 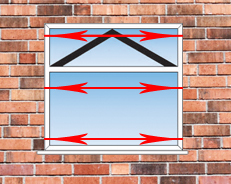 Measure each side window internally and ensure they are the same from one edge of the frame to the other. The height will need to be measured externally brick to brick including any existing cill. We will add 140mm to the external size for the two 90 degree corner posts which are 70mm square. 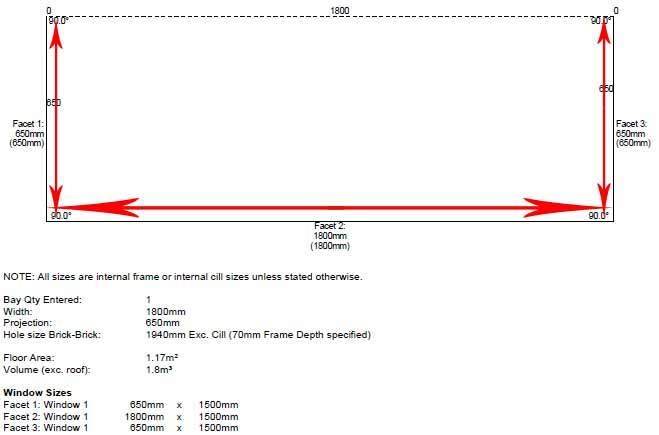 For example, if the internal width is 1800mm the external width including two 70mm corner posts will be 1940mm, see image below. Bow windows are slightly more complicated than bays, consisting of two or more sides and shallower angles. The width (back span) will need to be measured internally from the existing frame edge to edge. Measure each individual window facet internally from one edge of the frame to the other. The projection of the bow will need to be measured internally from the inside back span of the window to the inside point of the window frame as below. 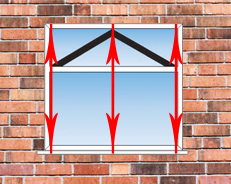 The height will need to be measured externally brick to brick including any existing cill. Please note: We are unable to accept responsibility for incorrect measurements. If you are unsure we recommend that you consult a professional fitter, joiner or builder to measure up. You can always call us on 0844 692 3828 and we will gladly help and advise.